Not yet published. Ships 5/1/2006. As he sat behind his lawyer at the defendant's table in the courtroom, no one who looked at the sweet-faced boy could believe that he was guilty of what he was on trial for-shooting a man in the back. 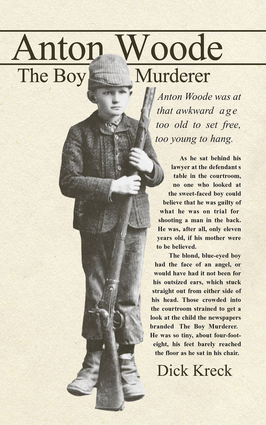 He was, after all, only eleven years old, if his mother were to be believed.So begins this true tale of juvenile crime, focusing on one incident in 1892: Murder by a young child. The murder itself proves to be secondary; the main focus is how this act by an 11-year-old shaped the lives of the people involved. Here again, just as he did in Murder at the Brown Palace, Kreck is able to use his journalistic senses to uncover the story within the story. What seems to be a simple case of one kid gone bad, turns into an investigation of how juvenile crime was handled around the turn of the century, and how the system has come full circle today with punishment taking precedence over rehabilitation. Review USA Book News/Best Books - October 16, 2006Anton Woode is an Award-Winner in the True Crime category of the Best Books 2006 National Book Awards. "A true crime book that delivers. Excellent writing and well-researched, Anton Woode, The Boy Murderer is highly recommended!" Review By: Sally Barringer, School Library Journal - October 1, 2006Adult/High School—In 1893, all of Denver was enthralled by the story of a local 11-year-old charged with coldheartedly shooting a visiting hunter for his pocket watch. As Kreck points out, the accused was at an "awkward age—too old to set free, too young to hang." Woode was eventually convicted of second-degree murder and sentenced to 25 years in the Colorado state prison—the youngest person ever sent there. The book follows his progress through the state's legal system—including his attempted escapes—and his life after being released. He became a cause celebre for juvenile justice reformers in Colorado, many of whom were influential in changing the system. The author focuses as much on how late-19th-century society treated juvenile criminals as it does on Woode's specific case, revealing some fascinating details about social and class prejudices at the time. He offers lurid and well-written details of Woode, his crime, and the seedy world in which he lived. However, the small black-and-white head shots don't do justice to the narrative's potential appeal.